This spring, bike committee members from Hacienda CDC and New Columbia spent six weeks immersed in a comprehensive ride leader training course taught by Community Cycling Center staff members. They learned everything from rules of the road, to bike safety checks, to communicating with children, and more. The training will allow committee members to lead bike rides this summer so that residents can safely explore their communities together on two wheels. But ride leader training is about much more than leading group rides. For many, this training offers an opportunity to gain leadership experience and put these skills to use in their daily lives. Elia, a ride leader from Hacienda’s Andando en Bicicletas en Cully (ABC) committee, works in a field picking raspberries during the day. In the future, she would like to lead bike rides with her coworkers out on the fields, after she gains a little more confidence on the road. For now, she is looking forward to passing on the skills she learned to her eight-year-old son, while going on bike rides with him. 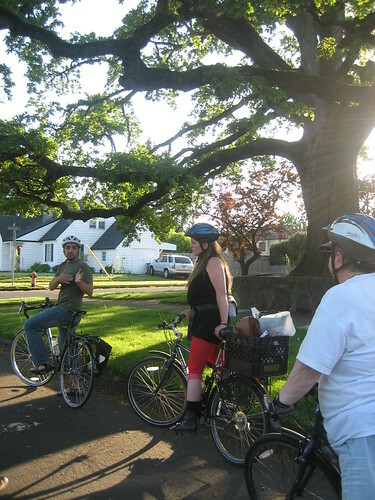 Elia formed new friendships through the ride leader workshops and enjoys sharing resources that aren’t necessarily related to bikes with fellow bike committee members. Michelle, a ride leader from New Columbia’s We All Can Ride committee, appreciates the patient, supportive staff from the Community Cycling Center. “The new training has taught me to be more confident about going on those rides. It’s made me more excited to teach kids how to do group riding. I’m excited to learn new routes and show kids the different nature areas.” Michelle’s top two favorite skills that she learned through ride leader training were repairing flat tires, and learning the rules of crossing streets with a group of children. In New Columbia, the summer bike rides will begin at the site of the Bike Repair Hub, allowing residents to repair their bikes if needed before beginning their journeys. Are you a confident bike rider? We are in need of bike ride volunteers to help support summer rides at New Columbia and Hacienda. To learn more, please email Randi, our Volunteer & Outreach Manager, for more details: volunteer@communitycyclingcenter.org.